250 PO Vacancy in Jammu And Kashmir Bank is released now. 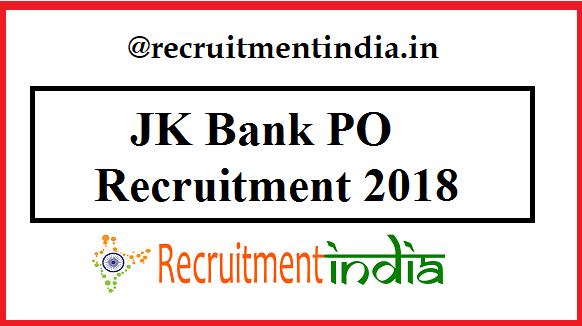 The advertisement of JK Bank PO Recruitment 2018 was uploaded here to give the certainty about it to the applicants. Detailed JK Bank Probationary Officer (PO) notification is accessible from 10th Oct 2018 @www.jkbank.com. And the JK Bank PO Online form is from 20th Oct to 6th Nov 2018. Full fledged details of JK Bank PO Recruitment 2018 is explained in this page in a simple manner. So that for the candidates to understand the recruitment specifications like eligibility, salary info will not take much time due to the help of this page. Jammu and Kashmir State people have really got a very good news who are looking for the best career. For those, banking career is opened now by the J & K Bank. Yes, huge vacancy notification is released by the J&K Bank. The title of that job notice is the J&K Bank Probationary Officer Recruitment 2018 of 250 Posts. This hiring process of PO vacancy was confirmed by the career sections of the bank only through an advertisement. The viewers who are checking this page may doubt us so for your confirmation below there is the advertisement of JK Bank PO Recruitment 2018 is available uploaded by Recruitmentindia.in portal. You simply go and check it. This post is written by taking the JK Bank PO Recruitment news as a reference. So now only the advertisement with basic details like a number of vacancies, educational qualifications, application starting date, and ending date. It also conveys that the detailed JK Bank Probationary Officer Notification from 10th Oct 2018. Aspirants, if you see the detailed notice all your doubts of the recruitment gets clarified without any hesitation. Then from 20th Oct 2018, the link of the JK Bank PO Application Form gets activated. The deactivation of the application will occur by the end of 6th Nov 2018. So candidates have lot t of time to review the JK Bank PO Notification 2018 from 10th Oct to 6th Nov 2018. So know all the details. More Employment News updates are posted on our page. Graduate Degree or PG Degree with 60 % marks or above from UGC recognized University. For this JK Bank PO Vacancy, the selection process is mentioned in the Notification. For JK Bank PO Salary details, just check the official JK Bank PO Recruitment notification. Category Wise Application Fees is available in the detailed notification. When the notification is available, then we will update the application fees details. Throughout this entire post, only one thing is explained. That thing is about the JK Bank 250 PO Posts Recruitment. The whole post is dedicated to this thing only. So, candidates, there is no hurry up the process. You have a given enough time by the bank career section to finish the enrolling process even after knowing the eligibility criteria. For anybody is there any confusion in checking the details, then you can take the help of this page. Minor point given in the Jammu And Kashmir Bank 250 PO Vacancy notification was described here for the candidates acknowledging purpose. In the given time for the application filing, postulants take a glance of this page and know all the details. For the eligible candidate’s preparation purpose, syllabus also is given below. For the JK Bank PO Application Form live activation, the candidates have to wait till 20th Oct 2018. In the job advertisement, the bank officials stated these dates. The chance to apply for JK Bank PO Recruitment is from 20th Oct to 6th Nov 2018. Qualification having candidates open the link of the application form which is given below for doing th submission of the candidate’s details in the form. A direct link is given for the time saving of the candidates only, so click it to Apply Online for 250 PO Vacancy @www.jkbank.com. Officials given the statement about the JK Bank PO Selection Process have two rounds that are written an exam, interview. For qualifying in the exam, get the previous papers from our page.